Is it possible to pin down and describe TIME if it is no more than an empty eternal form that is ever shifting? Conversely ART is received as a static object, removed from time and flux. We often describe traditional art as objects which capture a moment of time and hold it frozen for as long as the work survives. 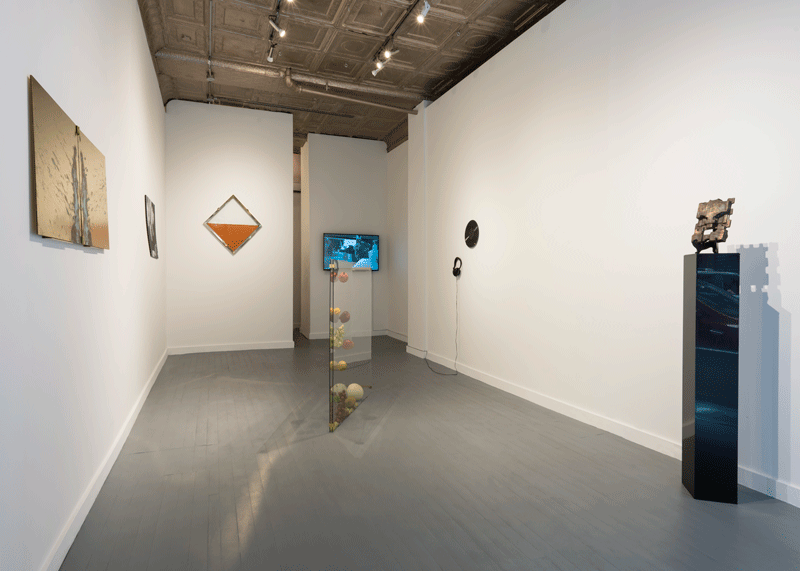 This exhibition assembles works by four international artists Ella Littwitz (Israel), Rachel Monosov (Israel), Benjamin Verhoeven (Belgium) and Reijiro Wada (Japan). 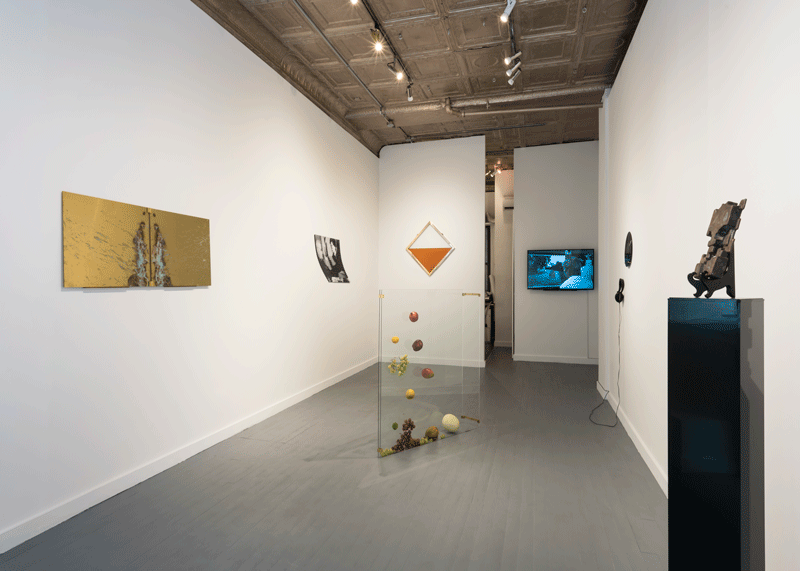 The works here are experiments which freeze, reconstruct, resurrect and mock time. 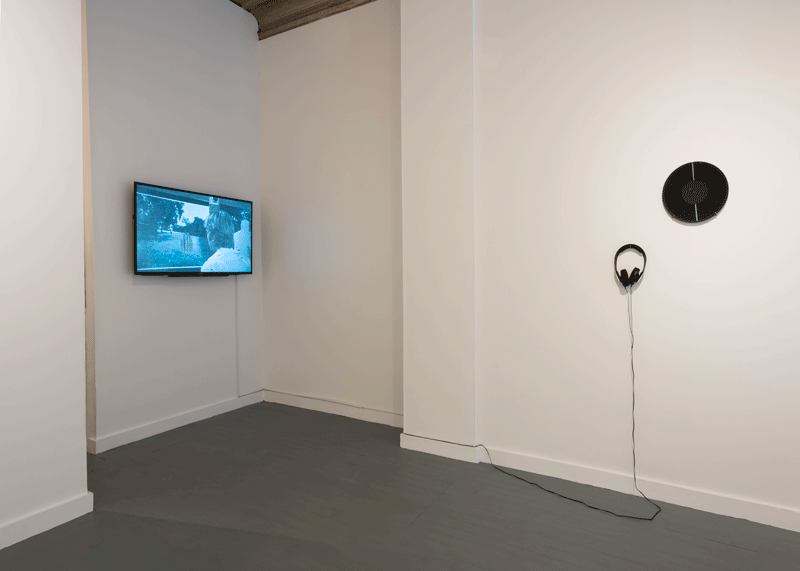 In Ella Littwitz’s Whistle (2013), the viewer hears the layers of history folded into a physical material, in this case a post war vinyl record. The starting point of the work is the found piece of broken vinyl in the Tempelhof excavation, which, upon examination of the artist, revealed fragments of English words from American military postwar broadcasts. Littwitz pressed a new vinyl retaining the shape of the original broken piece. The resulting 8:19 min track effectively resurrects the sound of its original as the listener hears surviving fragments from that dark point in history. 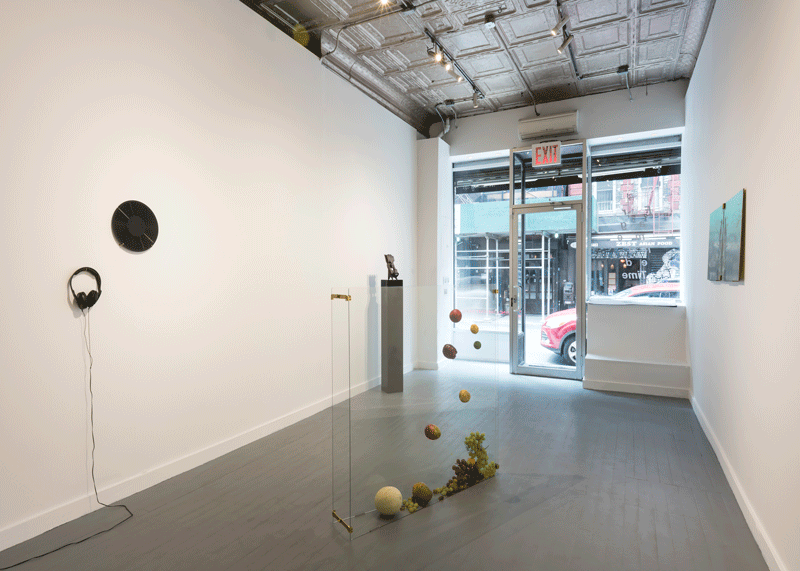 In Reijiro Wada’s Still Life (2016), a sculpture made with two glass plates which create an angled vortex where thrown fruit is captured, the fruit becomes part of the work – first through Wada’s action of throwing it into the sculpture where it is frozen in space; then as the marks left by the acidic liquid of the moving and rotting apples and lemons. 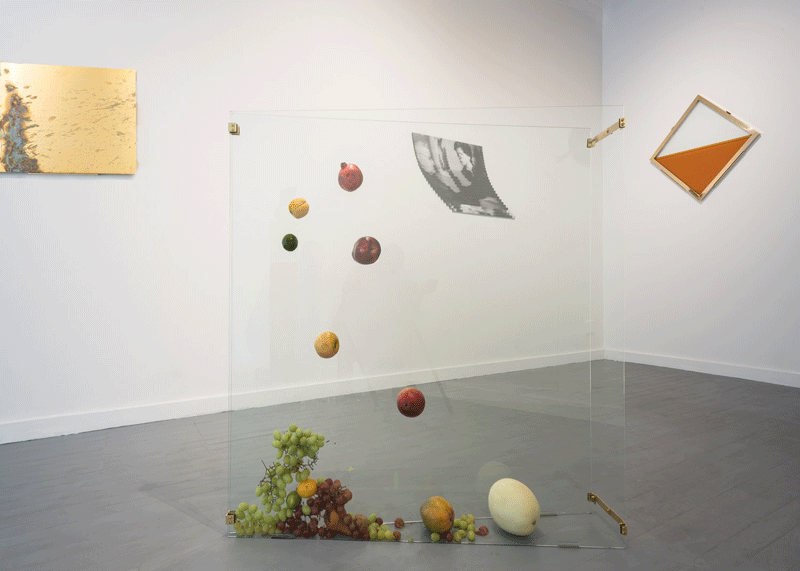 The work refers to the Baroque Vanitas still lifes as the glass plates ca​n be read as a canvas where a picture is painted anew each time it is revived through the throwing in of fruit. 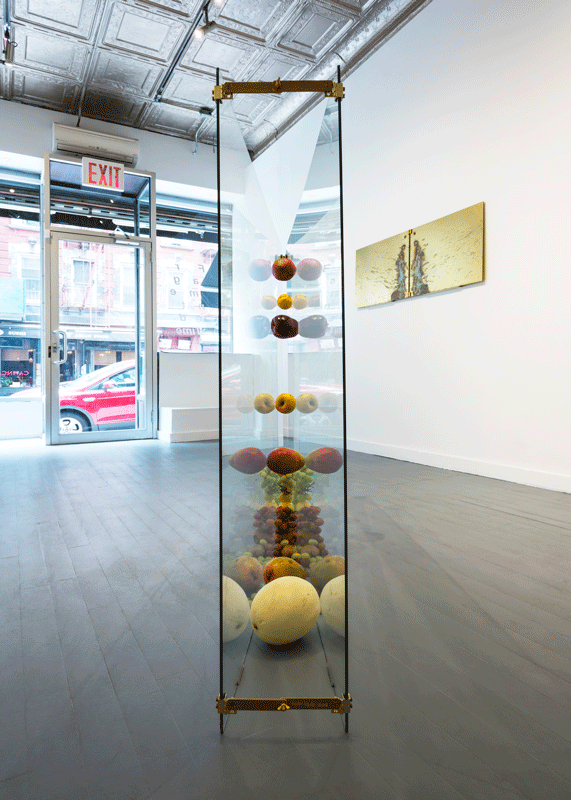 Wada throws various fruit into the intermediate converging space to create the impression that the pieces of fruit are suspended between heaven and earth. It becomes an abstract composition, where the fruits, depending mostly on their size and shape, are randomly trapped between the plates. The fruit dries out over time, reducing their volume in the process, which causes them to fall to the ground. Wada visualizes the “freezing” of time, making time stand still, which is contrasted to the inexorable flow of time. In Benjamin Verhoeven’s video work, Somebody was trying to kill somebody else (2014), the viewer is lost somewhere between movement and stasis. Verhoeven first scans moving images with a flatbed scanner, effectively making them stills, and then puts them back into animated movement. In this way, he reveals the core of a film, its materiality, showing its trace and absence. In this deconstruction, the narrative is lost, making the movement of time central to the viewer’s experience. One can examine the nature of film with all its glorious concepts of distance, time perception and repetition linked to the mechanical properties of the medium. By scanning the movie, the image is rapped into a single frame that shows the time and duration of moving images. The outcome of disrupting basic elements of cinema offers an alternative reality of the film. Rachel Monosov’s Exciting discovery in biblical archaeology found in Judean Desert: Artifact 3” (2016) is the show’s nod to the fact that we can never truly understand time. It is but a fiction of our human condition and the rigidity of our limited comprehension is easily disputed simply by flying to Mars. An artifact being represented as belonging to “biblical time” – is time just as malleable as religion and faith, belonging to a history which might never have been?